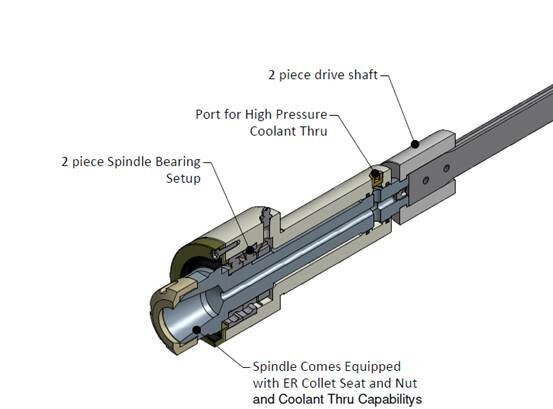 BME has designed a unique Drill Spindle for High Speed Drilling applications on National Acme Screw Machines. This unit replaces the traditional Acme style setup, that consisted of plain bearings with a ball bearing type thrust bearing. The BME unit incorporates a precision angular contact spindle bearing arrangement, that allows for a more precise end play setting, and a longer life span. These factors allow for better tool performance along with extend tool life. All of our spindles also come equipped with an ER collet seat, and the abiity to run true “High” pressure coolant thru the spindle. Our 2 piece drive shaft also make installation easier. Contact BME for pricing and delivery.